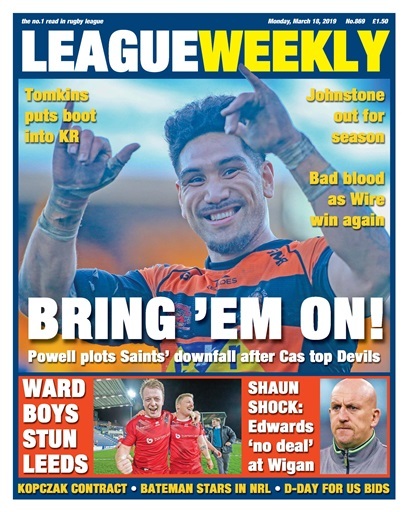 Cas boss Daryl Powell says bring on the leaders after the Tigers see off in-form Salford, while Hull KR slip to a late defeat at home to Catalans... catch-up with all the action from another exciting weekend, including Danny Lockwood's analysis of Wigan's loss at Warrington and Steve Mascord's take on Saints' victory over Huddersfield. Danny Ward reveals how the scrapped Super 8s helped his Broncos stun struggling Leeds, whose angry coach Dave Furner insists he's not rattled. There's drama off the field as Shaun Edwards reveals he hasn't signed a contract with Wigan. Will he actually take over at the DW? There's news of a new deal for a Wakefield player, and two more in the works - balancing out the bad news of Tom Johnstone's season-ending injury. Meanwhile, Denis Betts returns in a new job at Newcastle. 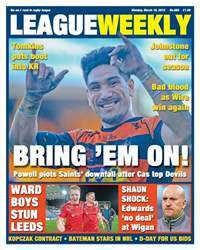 News of the proposed expansion into North America is imminent, Dave 'Nosey' Parker brings news of a potential RL revival in Blackpool, and Andrew Voss reflects on a brilliant NRL debut for John Bateman.